I’m here to say that not only is that terribly wrong, but the truth is actually the exact opposite. I’d be willing to say that Pinterest is, quite simply, the BEST “social network” out there if your goal is to drive traffic to your website. Other social networks have their purposes, but for clicks to your website, Pinterest wins easily, and with much less time or money invested (*cough* Facebook). It’s been like that month-after-month since I started investing a little time in Pinterest about a year ago (about three years later than I should have), except the random occasion when I have a big Facebook page share a post of mine and a get a lot of traffic (which is rare). Bear in mind, those stats don’t reflect the fact that I have put WAY more effort (and money) into growing my Facebook page, AND that still to this day I have about half the followers on Pinterest than I do on Facebook. I also share far more regularly on my Facebook page, and yet still generate fewer clicks. So again, the results from Pinterest are disproportionately higher than those from Facebook when it comes to clicks. This traffic is new growth to my site, and it isn’t like this comes at the expense of my Facebook traffic, on the contrary, my Facebook traffic is growing ever so slightly (as my page continues to grow). And Pinterest traffic can lead to secondary growth of your social media accounts like Facebook, Twitter, or Instagram as new users discover your website for the very first time. Staying Power: Popular pins have much longer staying power, unlike a Facebook post which may have a lifespan of a day or two or Twitter which has a lifespan of mere minutes. Quality Pins continue to generate traffic months after being created. Thus it is a cumulative effect whereby traffic over time from Pinterest tends to rise. It’s a Search Engine: Perhaps the biggest mistake is that people think of it as a social network when in reality it is a visual search engine. 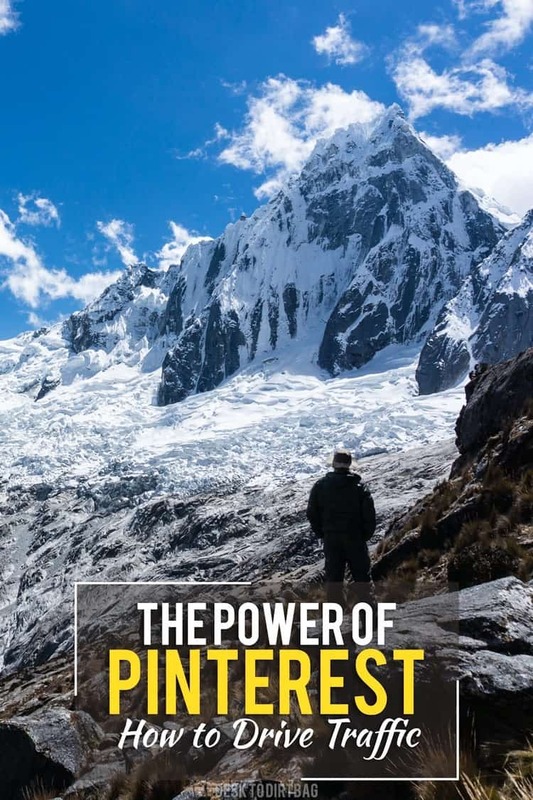 Pinterest isn’t for chatting and connecting, but rather tailoring content for what is basically a visual Google (again, this is why content is evergreen). You Don’t Need a Big Following: Again, I have less than half the followers I do on Facebook, yet it consistently generates much higher engagement with minimal effort (more about that later). Be Consistent: Pin every day if possible. It’s best to spread your pins throughout the day. I try to pin about 20-30 new pins every day. Use Vertical Images: Pinterest is best suited to vertically oriented images (ie portrait), because they simply show up larger. You should be creating (or simply re-cropping) images specifically for Pinterest. Include Others: Don’t just pin your own content (that’s what I used to do) but rather include pins from many other sources (this is how you can pin 20-30 new things per day). Links Included: Make sure your pins include a link back to your article, otherwise you won’t get any traffic! If you are uploading images manually, you click on the edit button and paste in the link. Text Overlays: Be sure to include simple text overlays across your images so users know what the pin is about and are more likely to click. You don’t need to get super fancy, but we will talk about some resources for creating pins later on. 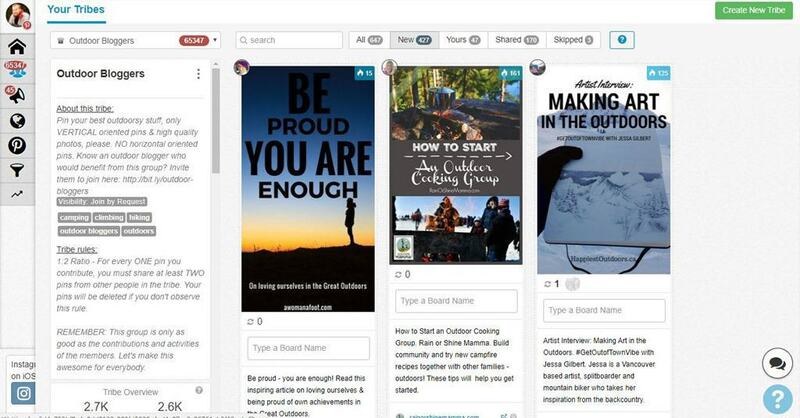 Organize Your Boards: Unlike other social media accounts, you are free to pin about pretty much anything and everything that interests you personally, even if it isn’t related to your blog. You could create a board for climbing, tattoos, coffee, puppies, and trucks. Just keep relevant pins organized into their corresponding board. Pin Popular Posts: You may think what’s the point in pinning something with 23k pins, but by pinning popular posts you increase your chances of exposing your personal pins to others when a user saves a popular post and then sees Pinterest’s suggested pins below. Engage With Others: Likewise, you should try and leave comments occasionally on popular pins as you work to build your account, more users will discover your boards and content this way. So you’ve got the fundamentals down. How do you create interesting, eye-catching pins that will generate clicks? Aspect Ratio: You should always create vertically oriented pins. The ideal ratio is 2:3, if you create longer, narrower pins, they get annoying to users. Image Editing: I just use Photoshop to throw up some simple text and designs. I don’t do anything fancy or complicated. You could use a resource like Canva in order to stick on some text and designs if you don’t have access to Photoshop. Rich Pins: Under your settings, be sure to activate rich pins, which means that Pinterest will pull information from the blog post it links to and include that information below the pin. It will typically pull the article title and a brief excerpt, which will make your pins more eye-catching and increase clicks. 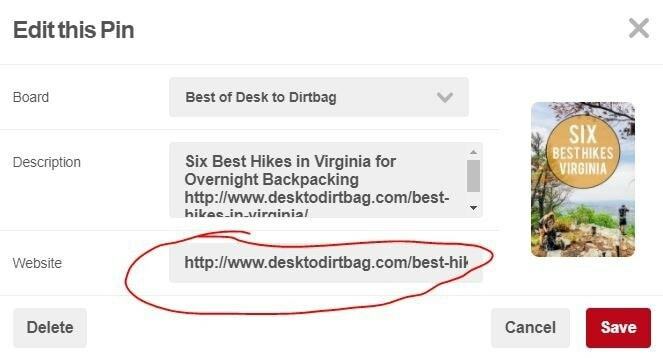 Include a Call-to-Action: Including in your description a simple “click here to find out blah blah blah”, will actually increase the number of clicks you receive. Tease a gear review or more details about a trail, or whatever it is you are writing about. Make it Easy to Pin: Pinterest growth can be very organic. People will click through on an interesting article, check out your awesome site, and then be happy to re-pin that same content. BUT you must make sure it is easy for them to do so from your website. Include the vertically oriented Pinterest image in your blog post, and use a plugin that allows them to share it with one click. I use the free WordPress plug-in SumoMe to do this. 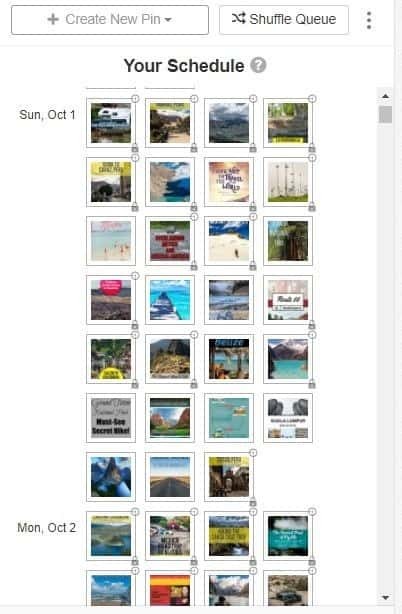 Join Group Boards: All across Pinterest, there are many, many different group boards out there, where multiple users contribute to a common theme. This is a great way to expose your content to new people. Often times it is as simple as finding the boards and reaching out to the owner with a message or email. P.S. I’ve got a group board for outdoor bloggers called “Go Outside More” (among others) which has become an active and awesome resource for people in my niche. Join a Niche Group on Facebook: There are many niche groups out there whereby members will contribute a pin and then every member will re-pin that pin within a certain timeframe, guaranteeing that if 50 people participate in a round, you will get 49 pins as a result. Pins that have higher re-pins are more likely to be shared organically. Schedule Your Pins: So this is a “secret” to becoming more active on Pinterest and putting in way less effort. I use a third-party app called Tailwind to schedule dozens of pins at a time, set to go out over the following weeks or months. I can literally have a calendar full of 25 shares, spaced evenly throughout the day, set months in advance, that way I only have to worry about creating and sharing new pins for my new blog posts. This is the ONLY way I can maintain an active presence while I am busy traveling. 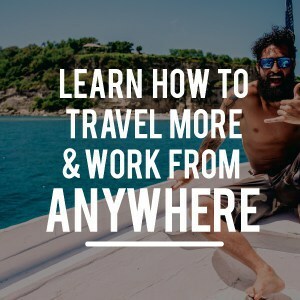 I also love it for the Tailwind Tribes feature, where a niche of people can contribute content and it results in not only a great place to source those 20-30 pins per day, but also where people are mutually helping one another to spread their reach. I’ve created a Tailwind Tribe specifically for outdoor bloggers, so if you’re interested, shoot me an email! I also belong to a number of travel specific tribes which have been amazing. I also use Tailwind in order to share an individual pin over the course of many months, by scheduling intervals across 20-30 different group boards (or personal boards), so that way every new blog post of mine gets continual new exposure every 2-3 days (for example). Tailwind costs $15 / month, but I’ve found the cheap price to be well worth it when I see the results it has helped me achieve in terms of traffic, and you also get access to some great analytics about your pins, most active boards, best times, etc. Recycle Your Best Content: Best practice is to create a board that is just for content from your blog (though you can and should share it to other relevant boards you have access to). 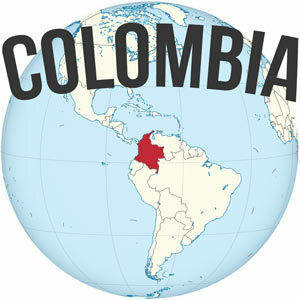 This is a place where someone can click through and see your best content. Within Tailwin you can also automatically pin your oldest content back to the top of a board, thus bringing old, unseen content back in front of the eyes of new followers and possibly breathing new life into it. This is good practice on any social media account because even among your biggest fans, there is inevitably content that they have never seen. 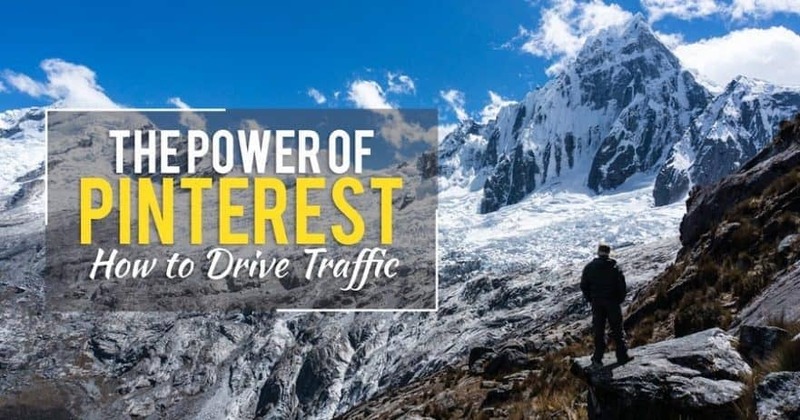 Anything you can do to reach new eyeballs and generate new clicks will help you with long-term traffic growth from Pinterest. – Don’t create misleading images that link to unrelated articles. Users will not be happy. Make sure your pins are relevant and link to quality content. – Don’t pin to a dozen different boards at the same time. You can manually share these pins to a different board every day, or use a scheduler app like Tailwind, mentioned above. But Pinterest supposedly also looks unfavorable on the pin if you pin it to more than one board within 24 hours. – Leaving the description, URL, or anything else blank. Remember, Pinterest is a visual search engine, so you should think about keywords and search terms when you create pins. It is this written word that is searched, obviously not the actual image and or any text within. – Don’t use hashtags. It isn’t like Instagram or Twitter, and while Pinterest recently instituted hashtags, the jury is still out on their effectiveness, and it’s best practice to think of it like a search engine, where hashtags aren’t necessary either. quickly curating new content from others to round out my sharing over the next few weeks via Tailwind (either from Pinterest searches or via Tailwind Tribes). In turn, I now receive at minimum 100 new visitors to my site per day thanks to Pinterest traffic, though often more. Occasionally, that consistent traffic will spike when an old pin suddenly goes “viral” once again. 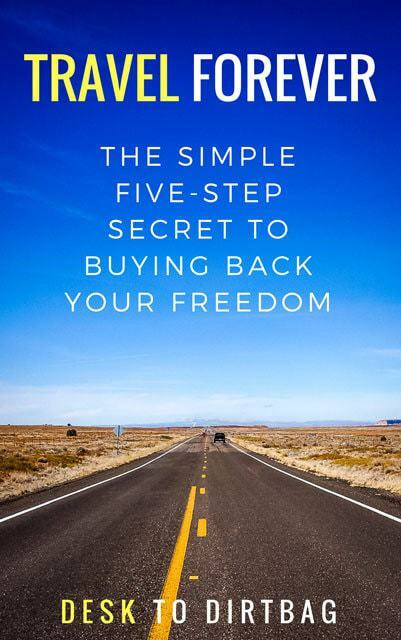 If you’re at all involved in earning an income online via display advertising or affiliate marketing, you should also know that any increase in regular traffic to your “money” posts will result in an increase in affiliate sales, so it’s a place you should definitely focus your time and effort in Pinterest. Are you using Pinterest to your advantage? What methods have you found work best for you? Did you enjoy this post on Pinterest for bloggers? Please take a moment to share it on Facebook, Pinterest (duh), or Twitter. I appreciate the time you’ve put into this, seems like some genuine detail. 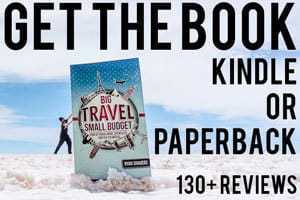 I have just started trying to monetize my blog, and its a steep learning curve at the beginning and there are a lot of sites with rabbit holes. 🙂 I have been doing the bare minimum with Pinterest so looking forward to testing the waters here. I’m curious, are you willing to share how much traffic you get on average to your site a month? Thanks Ryan, this is very helpful. But I’m a bit confused about this ‘pinning 20-30’ items per day. So if you are pinning other people’s content, do you mean that you are re-pinning other images from within Pinterest, or you’re going to websites, blogs etc and pinning from there? And whichever way you do it, what’s the advantage to pinning somebody else’s content on your own board? 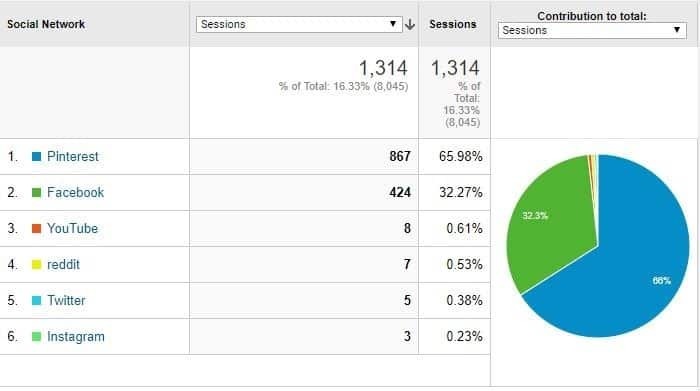 How does that drive traffic to your site? Surely you don’t put your own link on their image? Hey Caroline, I am re-pinning other people’s content generally through Tailwind Tribes or from Pinterest, not other people’s websites. The advantage is for one simply maintaining an active presence on Pinterest throughout the day, that way people may discover your content, boards or account, if a user saves a pin of yours (even from other blogs) and then gets recommendations via Pinterest afterward. Pinterest has its own algorithms but consensus says it is important to be active and not solely self promotional (both pinning other people’s content). No, no changing links, that wouldn’t be cool. 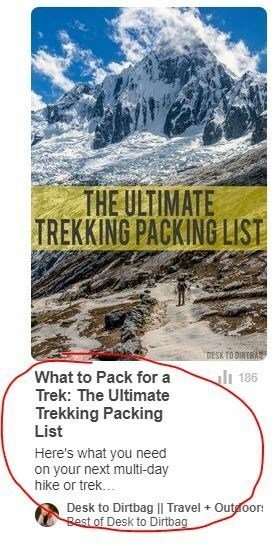 Very good point, I usually make a point to fill in my Pinterest images in both the Alt and Title tag with the description I want to pop up in the Pin. I also use a plugin called SEO Friendly Images to fill in those other random pics with an ALT tag automatically if I’ve otherwise forgot. Thanks for the comment, Mallory!